The average woman is likely to have about 350 periods in her life, yikes, that’s a lot of PMS to get through, better stock up on chocolate and ibuprofen. 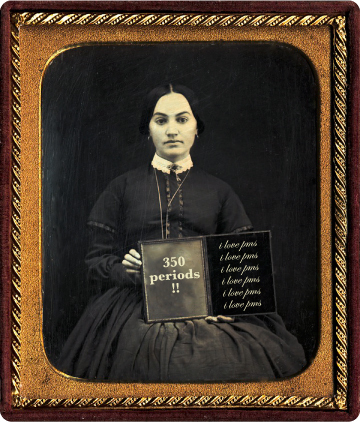 I don’t know about y’all but the PMS bothers me a whole lot more than the actual period days. Extreme bad moods, low energy and the desire to eat everything in the house – every month? I’ve often wondered how other women handle PMS and those foul moods where everything seems pointless and going out into the world is a huge chore, and dealing with people, oi vey! For me the light and fun is sucked out of everything, until like magic the period starts and everything swings back to normal. What do I do when under the grip of PMS? Well, even running is affected and the good endorphins are cancelled out by mean old hormones, at least that’s what it feels like. I’ll run shorter distances and be happy I did any mileage at all. Then there’s the imbibing of many romance novels…and when I run out of milk there’s no trip to the shops- I just start drinking my tea black. That’s why the first period day is a relief, back to fun running, milk in my tea and different sorts of fiction reading! P.S. Happy Memorial Day and thanks to all those who served in wars to protect peace.